Below we will walk you through the details of each method so you can put your coins to work on the world’s biggest online marketplace. Of all the current methods for using cryptocurrency on Amazon, Bitrefill provides the least amount of friction. This is because their service allows you to purchase Amazon vouchers directly that can then be redeemed almost instantly. Supported payment methods include Bitcoin (traditional payments & Lightning network), Dogecoin, Litecoin, Ethereum, and Dash. They provide a convenient walkthrough on the process here. 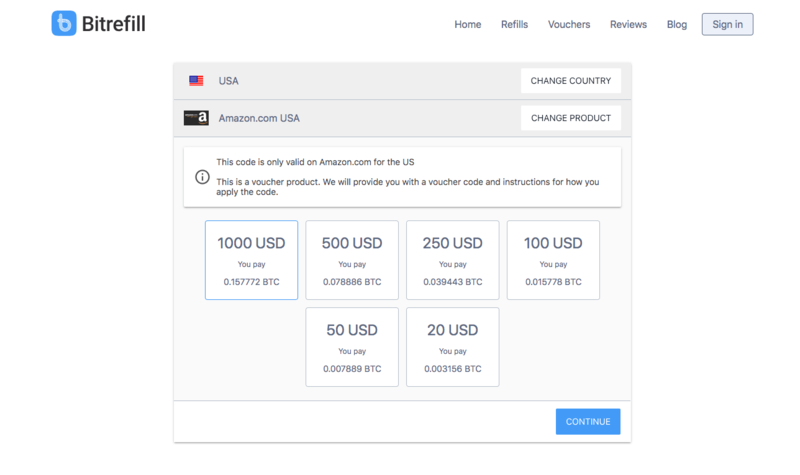 You’ll simply visit Bitrefill.com, choose a voucher denomination, make a payment with your desired coin, and then receive an Amazon digital code. This code is then valid for redemption on Amazon.com. Purse.io has a unique use case because it gives shoppers looking to spend cryptocurrency a built-in discount. This is because it connects users that want to spend their coins on Amazon with other users that have Amazon gift cards but want coins instead. 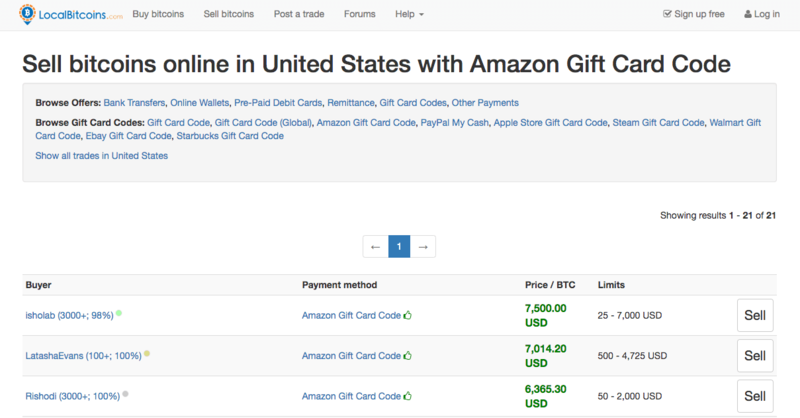 Since Amazon gift cards are illiquid, users who are willing to trade their coins for an Amazon purchase reap the rewards. When you use Purse.io to make an Amazon purchase, you are actually able to select discounts of up to 33%. While this is tempting, you should remember that you will have to wait for another Purse.io member to accept this purchasing opportunity. If you want your items quickly, it is recommended to go with the default 5% discount. The platform accepts Bitcoin and Bitcoin Cash by default, but also integrates with Shapeshift.io to open the door for 30+ altcoins. 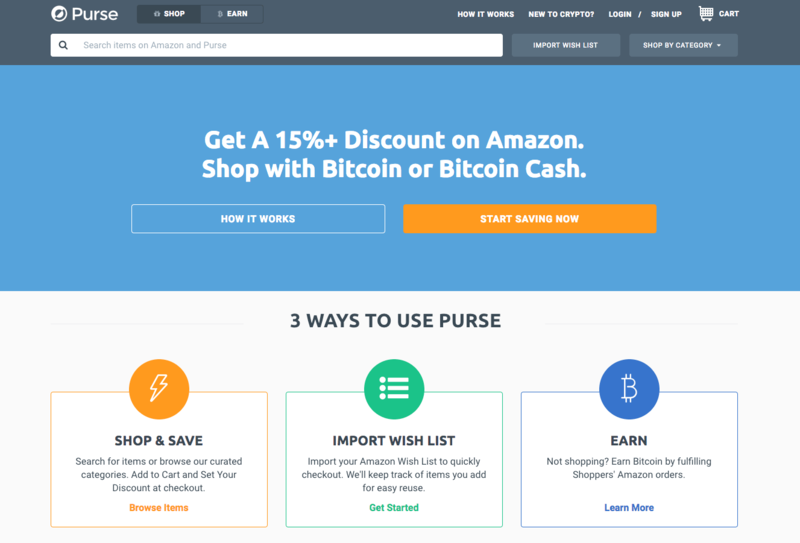 When you’re ready to purchase Purse.io allows you to either shop directly from a Purse account or via an import of an Amazon Wishlist. Select your products, set your discount, then let the platform take care of finding you a buyer. LocalBitcoins.com is an excellent resource for purchasing Amazon gift card codes, but we do recommend this method for expert Bitcoin users only. Since this site is mainly peer-to-peer, it is not as simple as using Purse.io or Bitrefill where the website walks you through the process. Pay special attention to the LocalBitcoins members you choose to work with. The benefit of this method is that it is a true marketplace. There are a number of different price points available and you can find a LocalBitcoins member that matches your needs perfectly. But, again, it is essential that you do your research before using LocalBitcoins. Blockonomi has an excellent guide to get you started. The gold standard for cryptocurrency hardware wallets, the Trezor One provides for secure storage of Bitcoin and a variety of altcoins including Ethereum, Litecoin, Dash, and more. Written by the open blockchain expert Andreas Antonopoulos, this book is a must-read for anyone looking to dive into the technical underpinnings of the most popular cryptocurrency. If you want to get into the world of cryptocurrency mining, you’re going to need some good graphics cards. Amazon is a great source and these cards are recommended based on this Crypto Christopher Walken approved build. 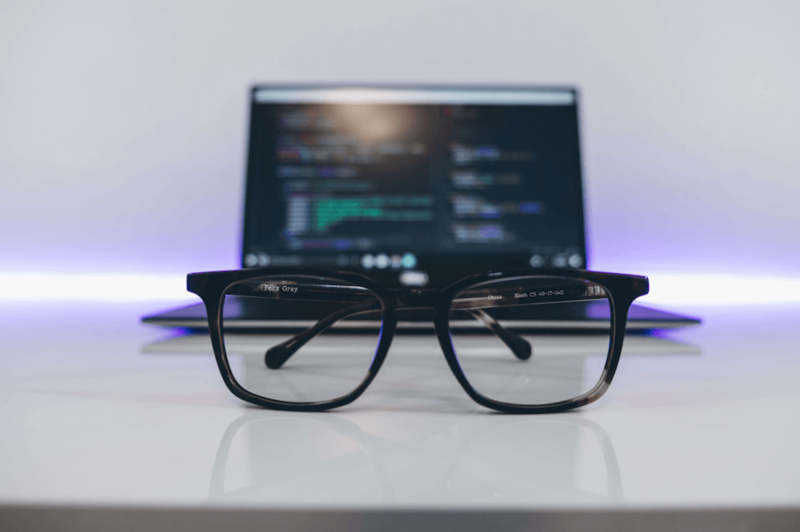 Looking to learn more about cryptocurrency? Check out our blog on what cryptocurrency is used for or feel free to reach out to us on Twitter!